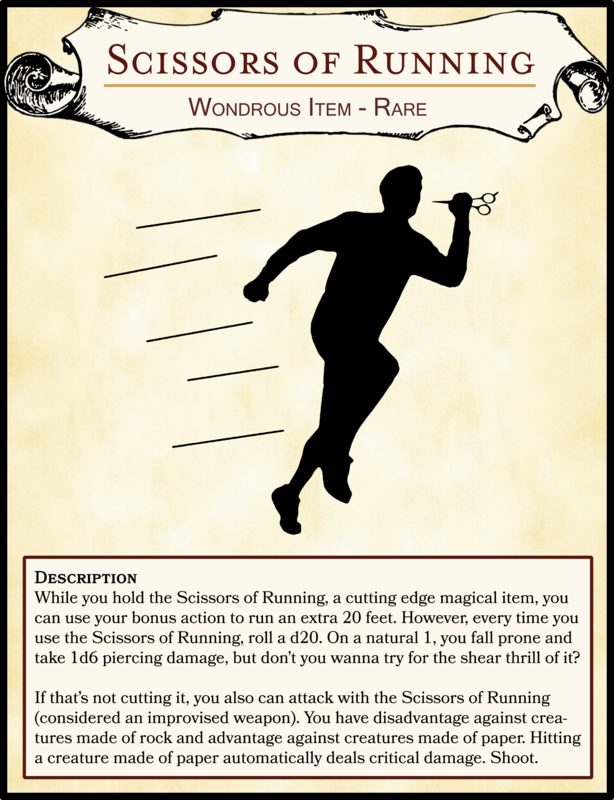 While you hold the Scissors of Running, a cutting edge magical item, you can use your bonus action to run an extra 20 feet. However, every time you use the Scissors of Running, roll a d20. On a natural 1, you fall prone and take 1d6 piercing damage, but don’t you wanna try for the shear thrill of it? If that’s not cutting it, you also can attack with the Scissors of Running (considered an improvised weapon). You have disadvantage against creatures made of rock and advantage against creatures made of paper. Hitting a creature made of paper automatically deals critical damage. Shoot.